New selection of black metal records released in 2018. 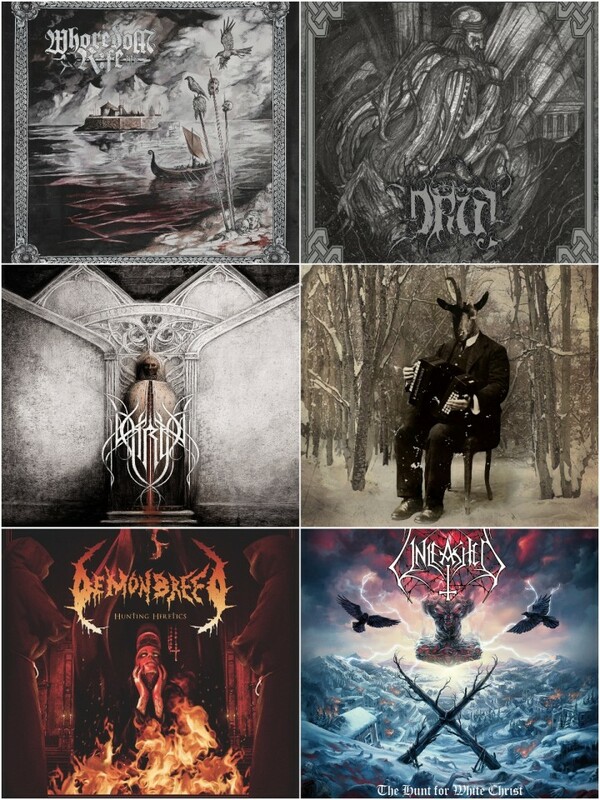 For the new Check 'Em All material, we latest albums and EPs from such acts as Whoredom Rife (NO), Druj (US), Thron (DE), Demonbreed (DE), Unleashed (SE) and Selvans (IT). Once upon a time, Norway was a gleaming beacon, however in more recent times, it has struggled to produce black metal that can compete with the innovation and quality of what’s happening outside of black metal’s 'family home', I can’t say Whoredom Rife are going to change the scene as a whole but I can say this; they do classic black metal well. Stripped down to its purest essence, Whoredom Rife to do a convincing job of evoking the dark and mysterious nature of black metal’s origins, there’s a touch of Dissection here, a smattering of Mayhem there, an aura of Watain hovering around, it sounds suitably lo-fi with it’s old-school reverb drenched vocals but it works, it doesn’t feel like it’s trying too hard to ape classic bands, it feels complete. They may not be re-inventing the wheel but Whoredom Rife are doing a damn good job of producing classic black metal that will satisfy anyone hoping to see a redemption of Norway’s calibre of black metal bands. This was a surprise, my default expectation for nearly all death/doom projects is that it’ll be average to poor; there really isn’t a better feeling than being forced to change your preconceived notions! "Chants to Irkalla" is a powerful and oppressive slice of death/doom. The album is abound with malevolence and sounds like the parts of Teitanblood when they devolve into slow punishing grooves; the wall of fuzz guitars is a suffocating blanket, pierced by resplendent vocal work and the expertly produced, thunderous drums. The challenge with so many albums within this genre is the ability to maintain the listeners attention as the music becomes mired in monotony, Druj have done themselves proud with their debut, it is a constantly evolving and enchanting beast, nothing outstays its welcome in its near 45 minute runtime. Death/doom isn’t for everyone but fans of the genre and even those who enjoy the crushing slower moments in war metal should find great things within. Abysmal feels like listening to a lost Dissection, Necrophobic or Unanimated album, the blend of thrash/black/death influences on this record echoes so many of the classic melodic Swedish cadre that you’d be forgiven for not knowing they’re German and only released their debut last year. The music is tight and belies the 'inexperience' of Thron, each song is well crafted and shows an intuition that normally isn’t displayed by a band until they’ve got some more albums under their belt, everything from the instrumentation through to the production shows a group that is well versed in creating compelling music. My only criticism is that Abysmal is an album that doesn’t necessarily sound 'fresh', much of the content here is ground that has been well trodden before by the bands mentioned previously, this style of black metal certainly isn’t 'en vogue' at the moment and I can’t help but question if it’s had its heyday. There may not be points on display for innovation but for those many fans that still cherish bands like Naglfar, Sacramentum, etc. they’re in for a treat. Formed from the ashes of Lay Down Rotten, Demonbreed play classic death metal in the vein of bands like Entombed, Grave and Dismember, thick wall of sound crushing riffs melded with catchy lead-lines and melodies, it all feels very Swedish and nostalgic. With so many of those original Swedish acts having either left their original sound behind or ventured off into new musical directions, there is plenty of space for a band like Demonbreed to fill the void. There will always be a market for bands that evoke this kind of sound, the only challenge is being able to stand out from the rest of the crowd, and I’m just not sure Demonbreed are at the point where they’re able to stand above the competition, nor do they make me want to prefer their release over one of the more 'classic' albums from the Swedish scene. The music is competent and the production is crisp and sharp, befitting the music completely, it just doesn’t do enough to move away from the herd, perhaps the next album will be a different story? In recent years Unleashed have incorporated more black metal influences in their music, whilst still retaining their core death metal ideals, "The Hunt for White Christ" continues this, built on a foundation of solid melodic death metal. Melo-death has been somewhat overdone at this point, it became so popular that the phrase 'familiarity breeds contempt' hovered around the genre like a bad fart, fortunately the newest Unleashed album does a good job 'clearing the air' and reminding you what made the style so successful in the first place. Unlucky number 13? Not for Unleashed; "The Hunt For White Christ" demonstrates a band still chock full of riffs and ready to bring their best offerings to the table. It's a consistent album, with elegant lead guitar work, catchy rhythms, pummeling drums and stellar production. What happens when you mix folk, black metal, dungeon synth and Ennio Morricone? Normally, you’d expect a disaster yet somehow Selvans manages to pull it deftly and convincingly. Now, this is not an album that will be to everyone’s taste, it’s eclectic, hectic and at times utterly weird, however it flies in the face of logic and weaves all of the odd elements together into one coherent (albeit unconventional) whole. This is an album that has been crafted down to it’s minutiae, the embellishments and support that other musical elements add to the core of the songs is well planned and whilst they’re surprising at times, they really shape the album into something that is unique. My closest comparison for them would be Mr. Bungle or Diapsiquir, although the music is very different they share a similar and very weird heart! My only criticism is that "Faunalia" is one that would struggle to fall into heavy rotation, it’s such an oddity that appropriate mood and mindframe would dictate when it’s listened to, it’s not an album to 'default' to when you’re struggling for inspiration, but for those chosen moments, it’s certainly an album to appreciate and cherish.